With more than 50 million registered players ‘Big Farm’ is one of the most successful farm simulation games worldwide. Its creators Goodgame Studios, Germany’s most successful game app developers, are now releasing a mobile version of the game onto the market. ‘Big Farm: Mobile Harvest’ is optimized for mobile gaming behavior and therefore a completely new, independent game. The player inherits an old farm, and with a little economic skill and hard work, the farm can be turned back into a flourishing business once again. 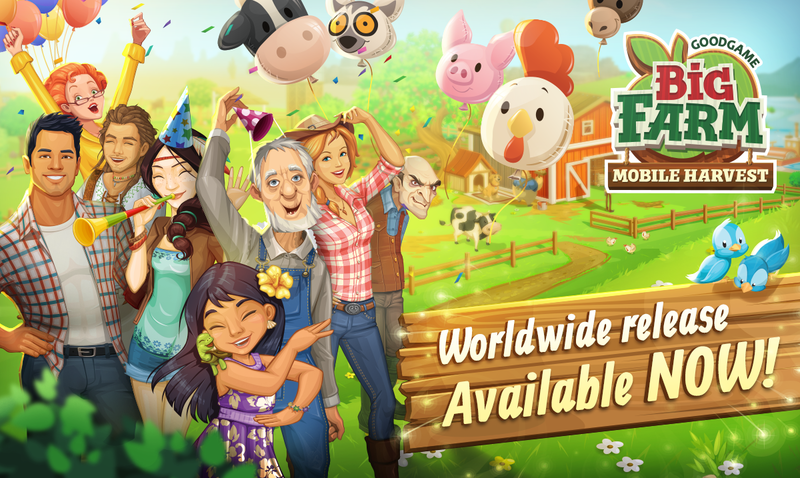 ‘Big Farm: Mobile Harvest’ is now available to players worldwide, on iOS, Android and Amazon devices. “The overwhelmingly positive feedback from test users gives us high hopes for the mobile version of ‘Big Farm’.” says Head of Studio, Simon Andrews, whose team created ‘Big Farm. Mobile Harvest’, “After all the effort we’ve put into it I’m convinced people will love the mobile ‘Big Farm’ as well.” At least Apple, Google and Amazon already do, as they’ve all decided to feature the game on their stores over the coming weeks. Its successful sister browser game, ‘Big Farm’, provided a template for the mobile version. The game’s unique cartoon style and basic mechanics have been carried over. But a lot of functions from the browser version have been adapted or even completely changed to deliver the best mobile experience possible. ‘Big Farm: Mobile Harvest’ is mostly about economic skill. Crops can be harvested and turned into animal food in the mill, animals and other products can be sold at the organic market, and fertilizer for the orchards can be gained from dung. Of course, to do all that takes some manpower, which on the one hand requires living space, and on the other requires pleasant working conditions for the staff; unhappy workers perform worse and thus production costs increase. Careful planning is necessary to manage everything you need to take into account. To help the player pave the road to success, Tessa, Benny, and their friends are there to give the player hints and tips, as is the player community. ‘Big Farm: Mobile Harvest’ players also have the chance to form cooperatives. This allows players to meet farmers all over the world, share strategic tips with them, and even send cooperative members loyalty points, which can be exchanged for farm items in the cooperative loyalty shop. A harvest year is full of exciting challenges. Every week sees the start of a fun new event. It could be organizing the Fairy Tale Festival, taking a tour through the Big Farm estate, or even planning a gruesome Halloween party. Cultivating crops, selling handmade goods to prove their business acumen, caring for animals, and making sure that workers are happy: players can expect all this as well as exciting events and quests when they play ‘Big Farm: Mobile Harvest’.